Unlike cancer heart disease is a largely preventable disease. A healthier lifestyle decreases risk. The key to heart disease prevention and risk management are: a healthy diet, being physically active, not smoking, avoiding obesity and diabetes. Heart disease is a main cause of death in Canadian women. 1 in 4 women die of heart disease in Canada each year. More women die from heart disease than breast, cervical and ovarian cancer combined. Most women are not aware of their risk of heart disease. Heart disease is still often thought of as a man’s disease. Many physicians are not aware of women’s heart disease risk. Misconceptions that cardiovascular disease is not a problem for women continue to exist. 38% of women compared to 25% of men will die within 1 year after a heart attack. More women die of stroke than men. Women often miss the early signs of heart disease or wait too long to seek help. 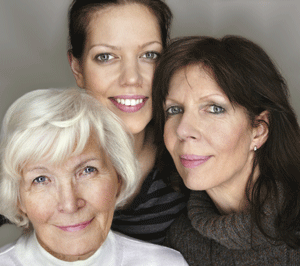 Women often see themselves as caregivers and don’t stop to take care of themselves. Women may be under-diagnosed and under-treated for heart disease. Women make up only 25% of participants in heart- related research studies. Physicians give less heart disease risk reduction information, either before or after a cardiac event, to women than men even if the woman has heart disease risks. Women develop heart problems later in life than men- typically 7-8 years. Diagnosis of heart disease is more challenging in women than men. Unlike men who tend to have a few large narrowing’s, women are more likely to have more small narrowing’ s in their arteries, and these are harder to detect. Diabetic women are at a greater risk of heart disease than diabetic men. Women with diabetes have two to three times chance of having a heart attack. Women who smoke risk have a heart attack 19 years earlier than non-smoking women. Women often do not realize the connection between high blood pressure and high cholesterol with their risk of heart disease. Women who during pregnancy have issues with either high blood pressure or gestation diabetes may as they age have a greater chance of developing hypertension or diabetes respectively. Menopause results in lower levels of the hormone estrogen which has been associated with helping protect women against heart disease. Physical inactivity doubles women’s risk of developing and dying from heart disease and stroke. WHHI © All Rights Reserved.